Chronic pain and IC warrior Sarah Bigham has turned her experience as a patient into an artwork series. Her beautiful watercolor paintings are created from dissolved supplements and medications she no longer needs. 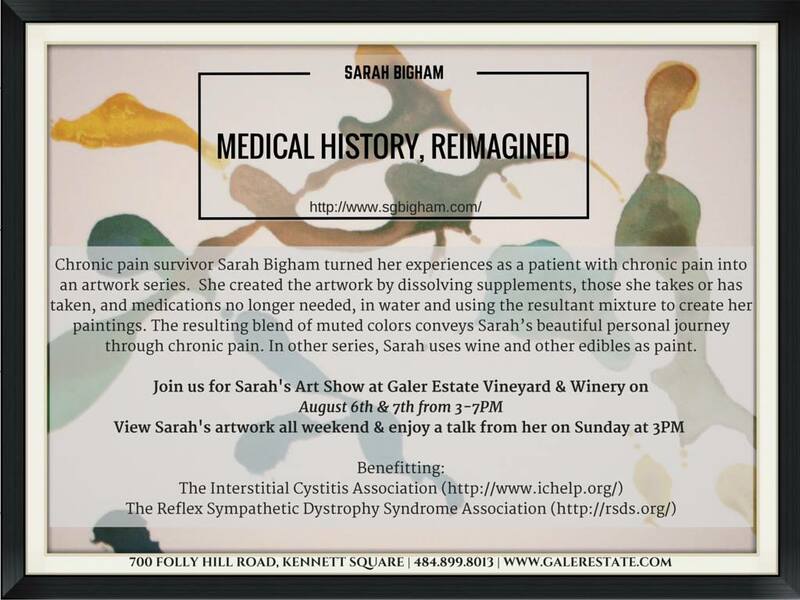 A showing of Sarah’s work, Medical History – Reimagined, is taking place August 6-7 in Pennsylvania. As a thank you for the information, help, and support she received from ICA, Sarah is donating 20% of the proceeds from her show to support ICA’s education, research, and advocacy work. For more information on purchasing her work or attending her shows, go to www.sgbigham.com. Thank you, Sarah for your beautiful work and support!